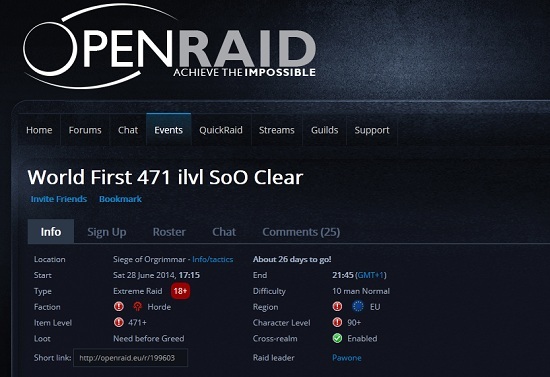 Artemol und seine eine 14/14HC Gilde versucht ein OpenRaid Event auf die Beine zu stellen, wo alle Spieler unter iLevel 471 sich durch die Belagerung von Orgrimmar kämpfen. - Be Horde on EU servers. - Have a full set of 1/1 Upgraded Heroic Dungeon gear(471 itemlvl). - Have a SPARE set of Timeless gear(No upgrades). - Have at least cleared it on normal on any toon. (More experienced players will always be prioritized).